(Nanowerk News) By combining engineered polymeric materials known as hydrogels with complex intestinal tissue known as organoids - made from human pluripotent stem cells - researchers have taken an important step toward creating a new technology for controlling the growth of these organoids and using them for treating wounds in the gut that can be caused by disorders such as inflammatory bowel disease (IBD). Investigators from the Georgia Institute of Technology and the University of Michigan are reporting this research in the journal Nature Cell Biology ("Synthetic hydrogels for human intestinal organoid generation and colonic wound repair"). The research, done in an animal model, was supported by the National Institutes of Health, the Crohn's and Colitis Foundation, and the Regenerative Engineering and Medicine Center operated by Emory University, Georgia Tech and the University of Georgia. The authors used the engineered hydrogels to create a 3D growth environment - known as a matrix - which provides optimal physical and biochemical support for organoid growth. Earlier approaches to creating this growth environment, pioneered by study co-author Jason Spence, Associate Professor of Internal Medicine at the University of Michigan, had used a natural matrix derived from a tumor cell line. The use of animal products is a significant clinical challenge due to potential zoonotic infections, which can be spread between animals and humans. "The use of a mouse tumor-derived matrix would limit any future applications of these organoid technologies in humans, and this work opens the door to research directed specifically for clinical applications," noted Asma Nusrat, study co-author and the Aldred Scott Warthin Professor and Director of Experimental Pathology in the University of Michigan's School of Medicine. 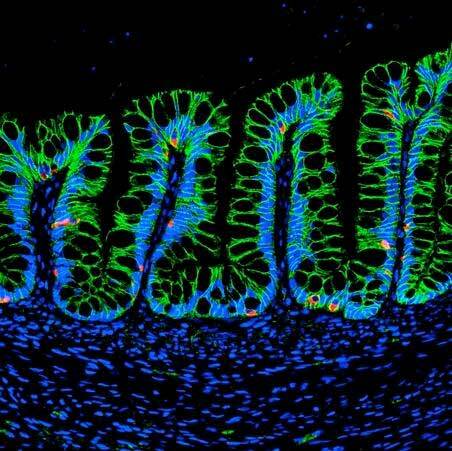 "We have shown that the hydrogel matrix helps the human intestinal organoids (HIOs) engraft into the intestinal tissue, that they differentiate and accelerate the healing of the wound," said Andrés J. García, Regents' Professor in Georgia Tech's Woodruff School of Mechanical Engineering. "This work provides a proof of principle for using stem cell-derived human intestinal organoids in a therapeutic setting." "The fully defined nature of these synthetic bioengineered hydrogels could make them ideal for use in human patients in the event that HIOs are used for therapy in the future," said Miguel Quirós, a University of Michigan postdoctoral fellow and co-lead author in the study. Added Nusrat: "In this work, we demonstrated that the hydrogels facilitate the transplantation of HIOs into an injured intestine, suggesting that this technique has significant implications for treating intestinal injuries caused by diseases such as inflammatory bowel disease." The synthetic matrix, developed at Georgia Tech, can be easily modified to suit the needs of the cells being hosted. For instance, Georgia Tech Graduate Student Ricardo Cruz-Acuña, the paper's co-lead author, experimented with several combinations before determining that a hydrogel made up of 96 percent water and containing a particular cell adhesion peptide was ideal for the HIOs. "Because our hydrogel system is easily modified, we can just alter other parameters to create the mechanical and biological properties desired to support many types of cells or organoids," said García, who holds the Rae S. and Frank H. Neely Chair. "The specifics may be different for other cells intended for different applications."